Ever since MaryJo received an electric pressure cooker for Christmas, I’ve been trying different recipes to use it for. 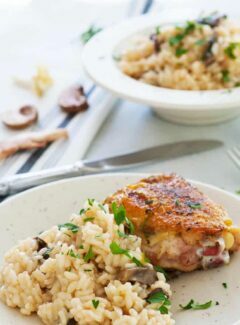 When I saw this pressure cooker mushroom risotto recipe, I had to try it. The Minneapolis Star Tribune had in their Taste section a recipe adapted from Lorna Sass who has a couple cookbooks featuring pressure cooking. Turns out that pressure cooking saves a lot of time and stirring when making mushroom risotto. The results are impressive. 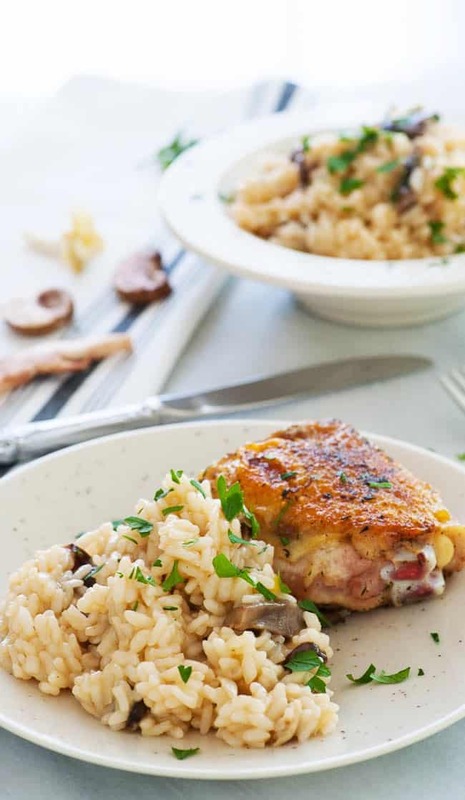 If you are more of a purist or don’t have a pressure cooker, the ingredients in this recipe could be used for making the mushroom risotto on the stovetop. Just be prepared to spend 25 to 30 minutes adding broth and stirring until the rice is fully cooked. 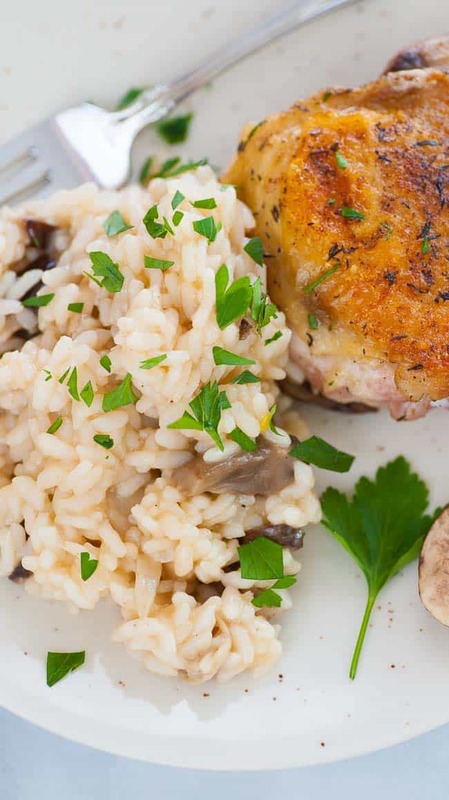 Making risotto requires a starchy rice and Arborio rice is the most commonly used and available in grocery stores. You might also look for baldo, violone nano, or carnaroli rice, but these are a little harder to find. All these varieties are generally referred to as short grain rices. The new multi function pressure cookers are amazing since they can be slow cookers, saute cookers and pressure cookers. What this essentially provides is a way to make a dish using one pot. No extra clean-up, which I love. To make the pressure cooker mushroom risotto, start out by sauteing the onions in olive oil for a couple minutes. Next, add in the rice and stir to fully coat with the oils in the pot. I then added the chopped mushrooms along with 1 cup of dry white wine. Stir the wine in and the rice will pretty much absorb the wine in 1 to 2 minutes. Then you add the 3 cups of vegetable broth, put the lid on the cooker and set it for 4 minutes. How easy is that? Once the pressure cooker beeps that it is done, manually let the pressure out of the pot. Take the lid off and turn the cooker back to saute. You’ll probably have a little too much liquid which has to be cooked off. That should only take 2 or 3 minutes. You want the rice to be pretty juicy since you’ll be adding the grated parmesan cheese, and the rice will keep absorbing liquid as it cools. When the rice is plated, it should have a bit of broth pooling under it. That’s it. If you don’t own an electric multi-cooker, you can buy one right here. Mine is a Crock Pot brand, but the Instant Pot brand is also very popular. The Crock Pot brand might be ten to fifteen dollars less than the Instant Pot. I believe all busy families needs one of these. 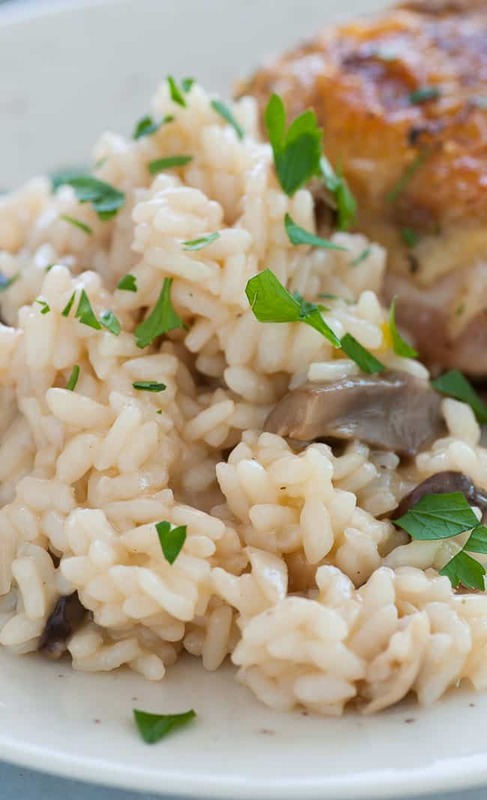 Here’s the full printable recipe for pressure cooker mushroom risotto. 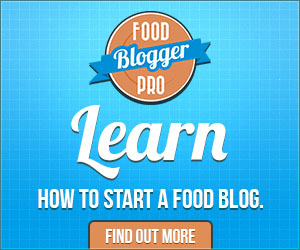 Disclaimer: This recipe post contains an affiliate link which means Joe’s Healthy Meals will receive a commission on any sales generated through this link. Easy pressure cooker side dish. Set your electric multi cooker to saute, add the olive oil and diced onion and cook for 2 minutes to soften slightly. Add the rice to the pot and stir to coat the rice with the oil, 30 seconds, then add the chopped mushrooms and white wine. Stir until most of the wine is absorbed, about 2 minutes. Add the vegetable broth, put the lid on the cooker and set for steam, high pressure for 4 minutes. Once the pressure cooker is done, manually release the pressure and remove the lid. Turn the cooker back on to saute, and cook to reduce the liquid slightly, if necessary. (The rice should be somewhat watery). Stir in the parmesan cheese and taste, adjust salt and pepper as desired. Serve immediately, garnish with chopped parsley and additional grated parmesan. Adapted from a Lorna Sass recipe as told by Mark Bittman in the New York Times. Delicious comford food in half an hour on a weeknight!